The limestone barracks in front of you, built in 1778, is among the oldest and most important surviving American military structures in the nation. The barracks consisted of two L-shaped buildings, but only the eastern wing remains today. 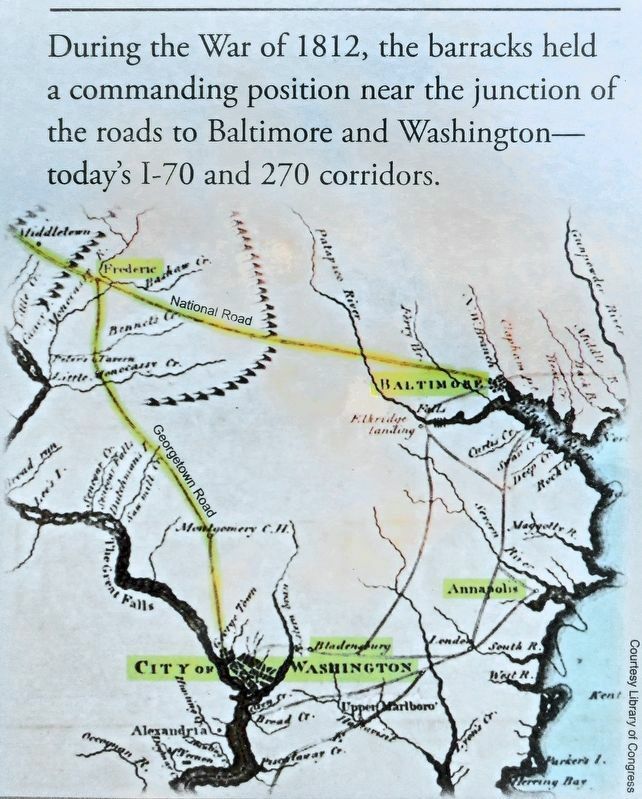 During the War of 1812 waves of American troops from Maryland and Virginia encamped here on the way to Washington and Baltimore to repel British forces. 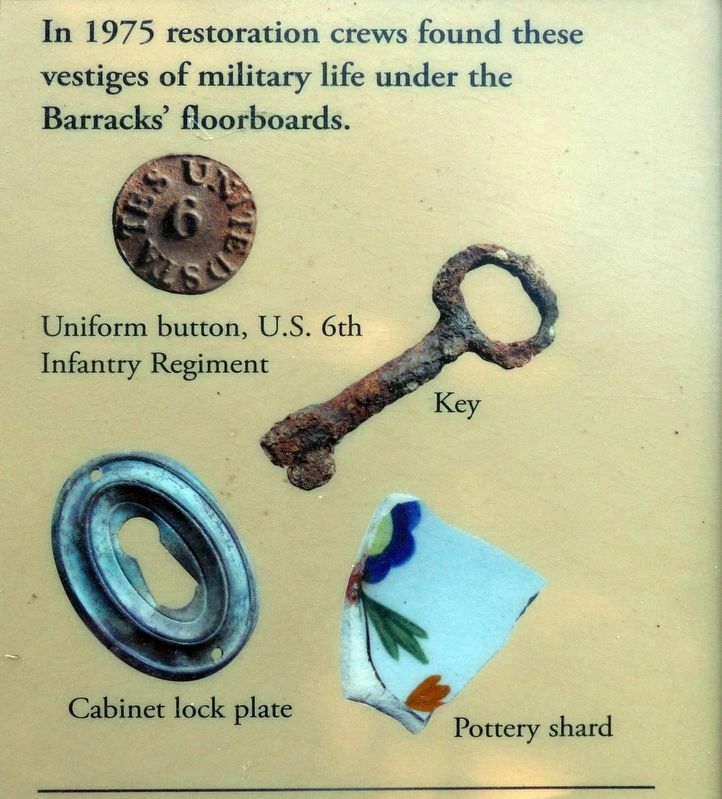 In addition to serving as a military command center and arsenal, the barracks aided in safeguarding Maryland state documents during the war, and holding captured British soldiers after the Battles of Bladensburg and Baltimore. The Barracks are currently (May 2017) undergoing renovation. here, among them the 6th U.S. Infantry, as well as militia from Maryland and Virginia. 1868 — The Maryland School for the Deaf occupied the barracks and surrounding property. To make way for the school's Main Building, the west wing of the barracks were dismantled. Location. 39° 24.533′ N, 77° 24.582′ W. Marker is in Frederick, Maryland, in Frederick County. Marker is at the intersection of Clarke Place on Clarke Place. Touch for map. At the Maryland School for the Deaf. Marker is at or near this postal address: 101 Clarke Place, Frederick MD 21701, United States of America. Touch for directions. (a few steps from this marker); a different marker also named Frederick Town Barracks (within shouting distance of this marker); The Frederick Brick Works (approx. ¼ mile away); Gen. Bradley T. Johnson (approx. ¼ mile away). Touch for a list and map of all markers in Frederick. More. 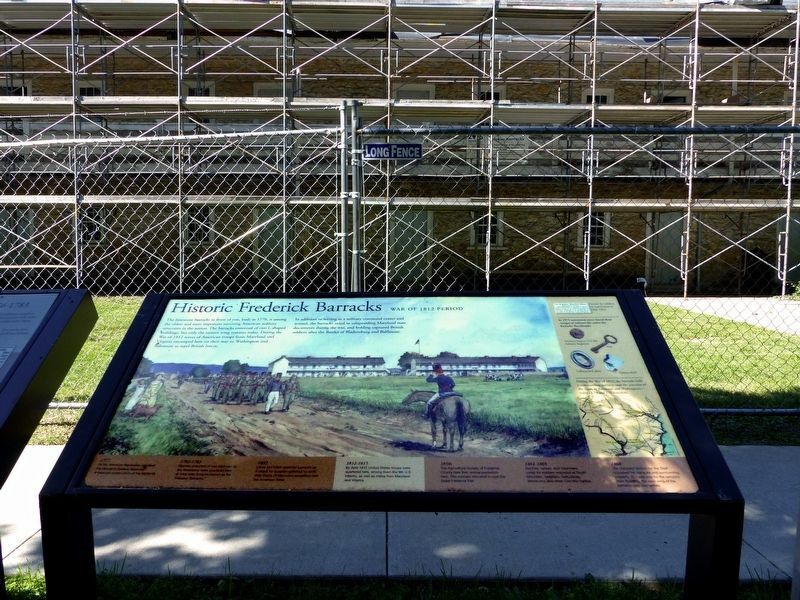 Search the internet for Historic Frederick Barracks. Credits. This page was last revised on May 14, 2017. This page originally submitted on May 12, 2017, by Allen C. Browne of Silver Spring, Maryland. This page has been viewed 145 times since then and 10 times this year. Photos: 1, 2, 3, 4, 5, 6. submitted on May 12, 2017, by Allen C. Browne of Silver Spring, Maryland. • Bill Pfingsten was the editor who published this page.